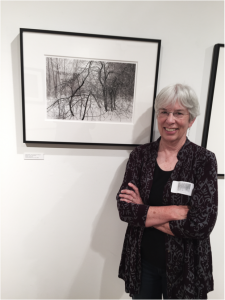 One of my photographs, Plum Thicket with Woods, was chosen for the exhibit, Patterns in Nature, at the Minneapolis Center for Photography. The exhibit was juried by Jim Brandenburg and is up from July 26 to September 6, 2015. My husband and I made a day trip of driving down for the reception on July 26th and got there early enough to be able to study the photos before the crowds came. It’s a visually rich and varied exhibit, beautifully presented and also documented in a book showcasing each photographer’s work. See more images and read about my Plum Thicket series.